It’s actually been out of my yard for the past few weeks. But I felt pretty bad about letting it go and it took me a while to put my thoughts into worlds. I bought the car with dreams of returning it to the road over the course of a few weekends and driving around in a wonderfully weathered Lotus. The seller said he was going to scrap the car if nobody bought it so I figured “what the hell?” and bought the thing. If nothing else, i could save it from the crusher. My friends and I dragged it home behind my 1999 Suburban and dragged it into my yard with my 1969 Chrysler. Today I had to use my 1969 Chrysler to tow my 1969 Lotus into the yard. Once home, I quickly realized how over my head I was with this project. The engine had sat open for years and all the coolant passages looked like Egyptian tombs. The frame was so rusty that when I tried to undo bolts on the frame, coin sized chunks of the frame would come out with the bolt. The front crossmember was so rotten that the lower A-arm had detached. This was not a car that could be fixed in a few weekends. Initially enthusiastic, I dug into the project but it seemed like everywhere I looked, more and more mechanical catastrophes revealed themselves. After calculating the cost of parts it needed, (Not including the hundreds of man hours it would take me) I had to concede defeat. I was in over my head. I hated the idea of letting it go. I wanted to be a hero that revives cars that have had a rought time in life and returned them to the road. But I just couldn’t do it. I failed. I have menial welding skills, I have no welder, little more than hand tools and a dinky one-car garage. I was hardly outfitted for the full-on restoration this car deserved. I suppose I could’ve taken the plunge, forged into the unkown and dived head first into the restoration but I was scared. The money in parts that it needed would’ve wreaked havoc on my bank account and I have no real experience in restoring cars that are this far gone. I surrendered. 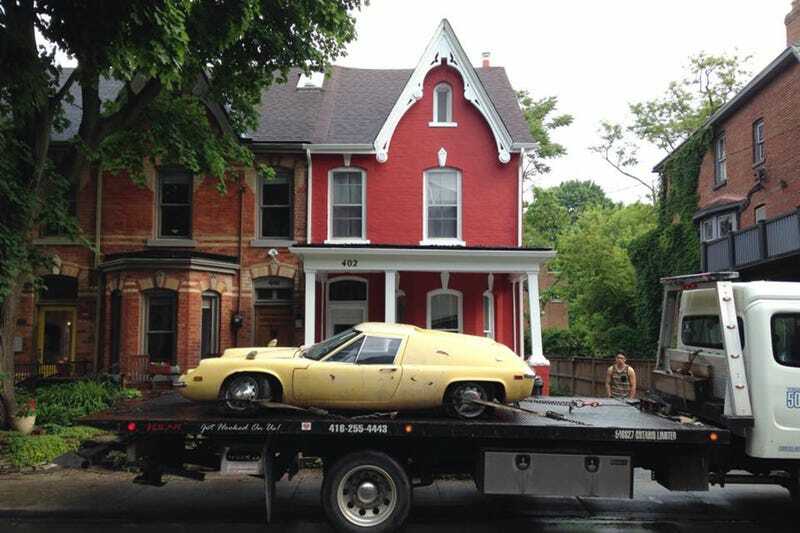 After listng it on Kijiji for just two days, a buyer was found, and the car was towed away, never to be seen again. It’s doubtful that I’ll ever have the opportunity to find one of these this cheap ever again. It’s not a decision i took lightly. I loved my time with the car and hopefully I can find another Europa that’s closer to being roadworthy in the future. I feel like I let you guys down. I couldn’t do it. But the new owner has lots of experience in classic car restorations so at least it will finally get a second chance at life. And who knows, maybe I was it’s pardon off death row so it could have that second chance.